I am quite pleased to introduce you to a company called Read Naturally, that I was introduced to me through The Crew at The Old Schoolhouse Magazine. 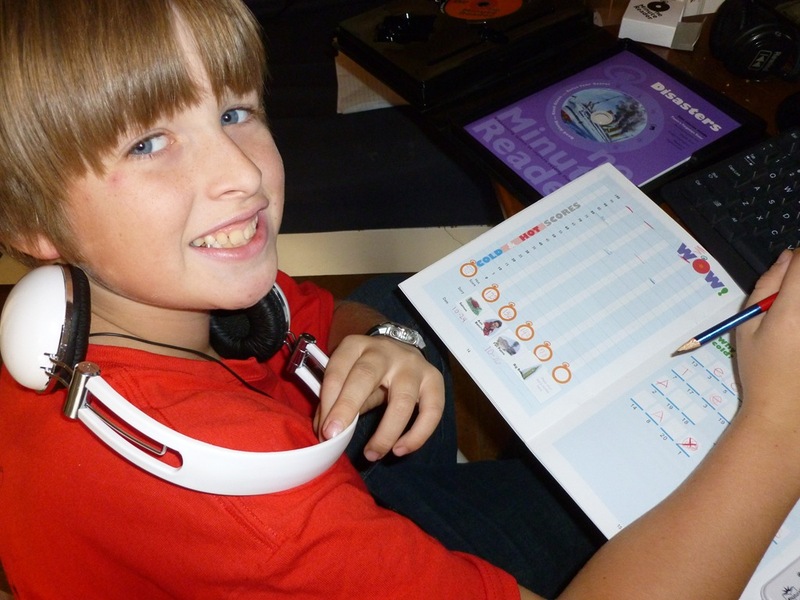 Read Naturally has a 20 year + history of helping kids and adults read fluently. Our Review Crew was offered a couple of choices – we are glad that we chose the One Minute Reader to review. 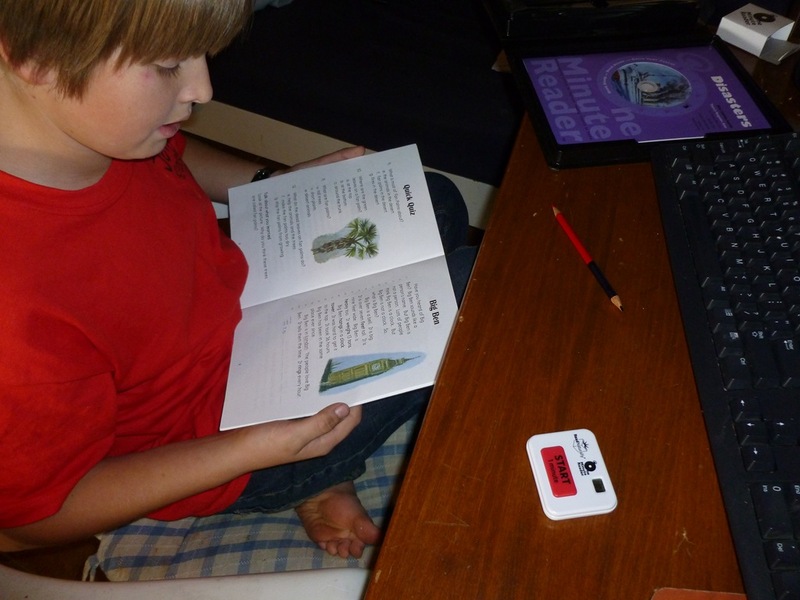 We choose the One Minute Reader because both of my boys are reading well, sounding out any word, and feeling confident to read aloud now, but at times, they are lacking the speed confidence. I will probably continue to think about reading vocabulary as an issue for a couple of more years, until they have quite a few good books under their caps. Speaking of Good Books – one thing we really enjoyed about the little reader stories with One Minute Reader, is that they are Non-Fiction. A short historical or scientific story with a few facts and dates to help enrich their reading time. Both of my boys bored of the early readers of twaddle that the only goal was to increase reading words that were often used on worksheets in the classroom. They wanted to read to gain. Gain information – confidence – grow. “Students develop fluency through modeling (Read Along step), repeated reading (Read Alone step), and progress monitoring (Marking Hot and Cold Scores steps). Students should work in One Minute Reader for 15 to 30 minutes a day, three to five times a week. 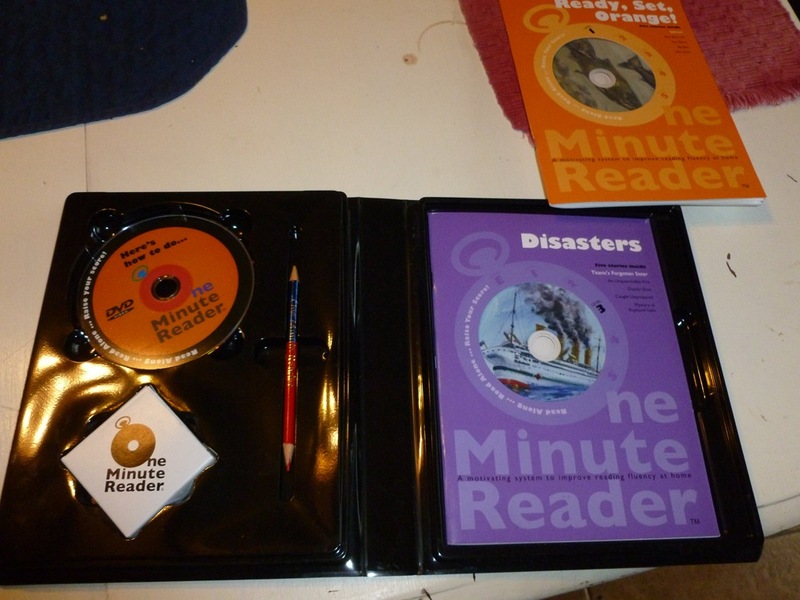 and then an additional Level 3 book, Disasters. Ok – So – How did we use it, and what do we recommend? – You’ve read so much – I’ll cut to the chase. If you have a beginning reader – I HIGHLY recommend this series. I wouldn’t jump in with both feet and order their starter level bundle for $99.00, but I would order the Starter Kit for less than $25.00, and then order books as you need them for $12.95 each. 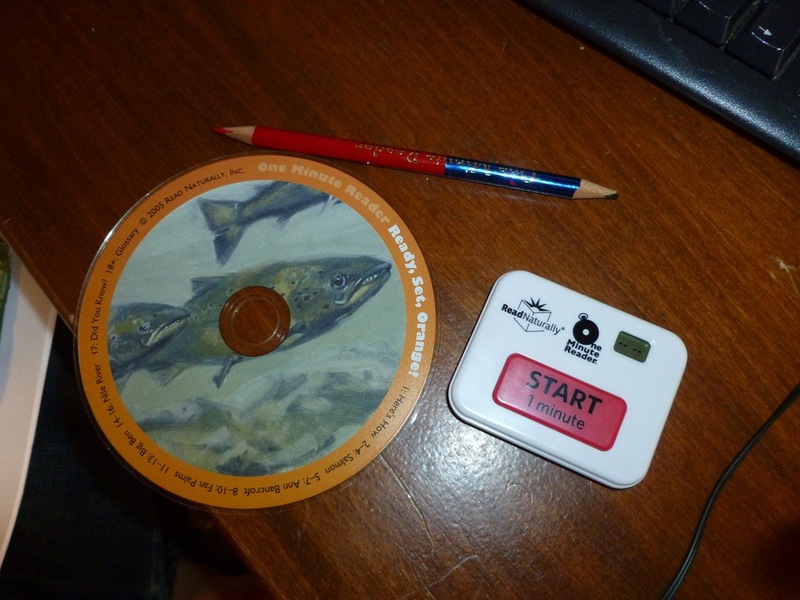 Jon has been VERY willing and able to pop the CD into the computer (We don’t have a CD Player right now) and start his lessons. 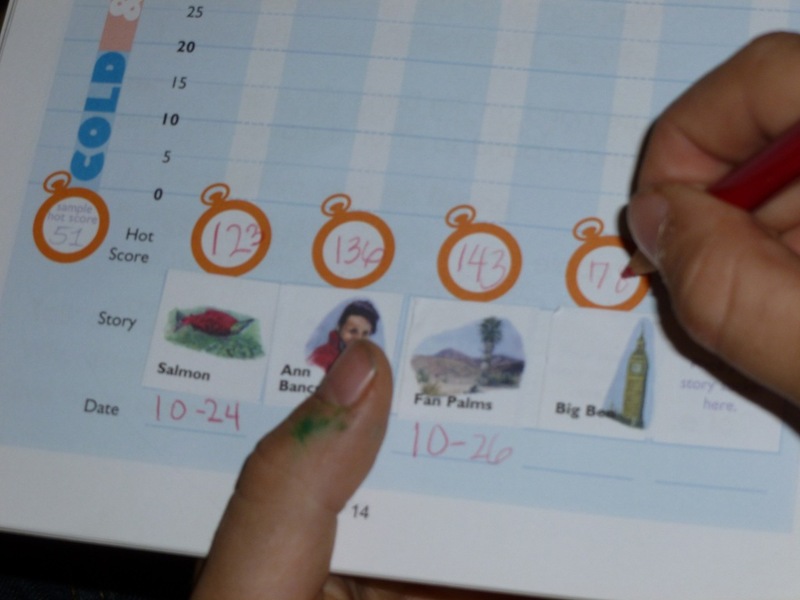 He reads the story one time through, with a one minute timer, skips and marks any words he can not sound out, and then writes his score in the blue. A cold score. 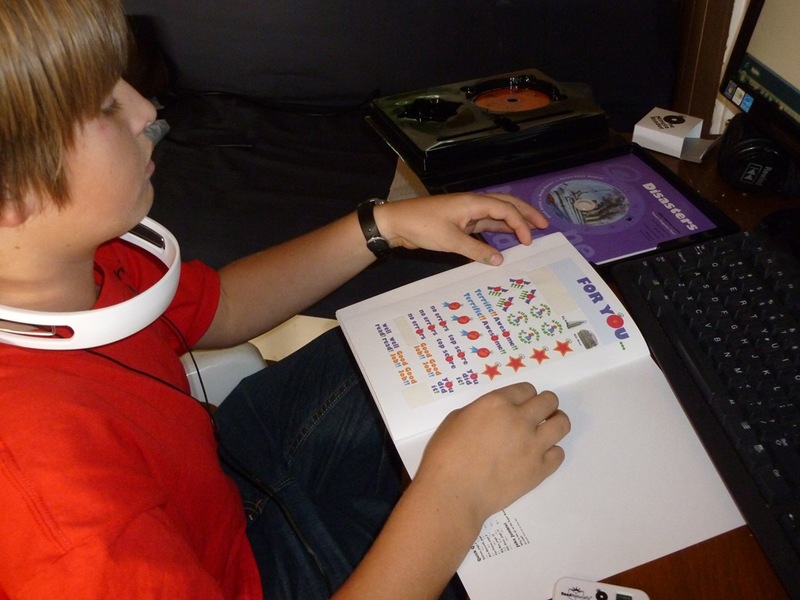 In the orange level reader, all of the words were easily read by him, but slowly read on the cold score – 68-78 wpm. 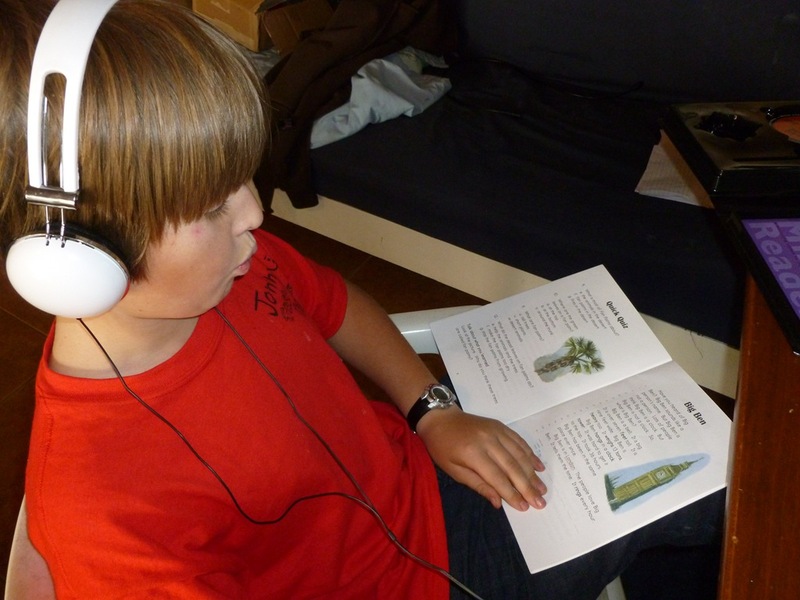 Next, he reads the story along with a teacher on the CD. I could have downloaded the stories to the iPod, but we are still having issues with the software upgrades, so the computer worked for us. He reads it aloud with her 3-4 times, then reads it again with the One Minute Timer, and marks his score again, this time in Red – the Hot Score. Each time, without fail, he practically doubled his reading speed. He’d jump up to 120-140 wpm in a few short minutes. I Can NOT tell You ENOUGH how much JOY this brought to my young son!!! He says, besides Pig Pile, This is His FAVORITE Review, well, and he named a math one too . . . but whatever – He Really likes this way of reading. And it’s more fun than playing with plastic pigs folks. I think that will be our new rating scale. . . “This Review has been Given 5 Pink Plastic Pigs”. I’ll We’ll work on it. 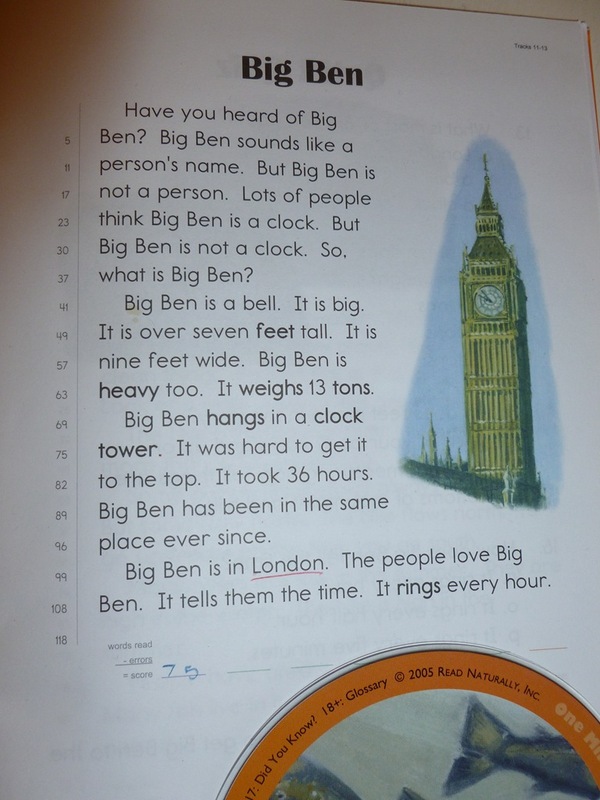 . . . .
One Minute Reader Booklets have comprehension questions after the story – both of my boys have never had troubles with this area, by the time they work through the story, they’ve almost got it memorized. Poor Kids. – but if yours reads without taking it in, there are quizzes, games, stickers, motivation for really understanding and learning about what they are reading, speed is not the only desired result. We will continue on through the Orange Book, I think we have one more story, and then move to the Purple book that they gave us, then take the placement and put him in the level he needs to be before we order another book. We will order another book. I have not seen the very first series Level E, but I’m not thinking this is a Learning To Read curriculum, this would boost your student at his reading level, however, after Level E or 1, it will boost his word vocabulary bank for sure! 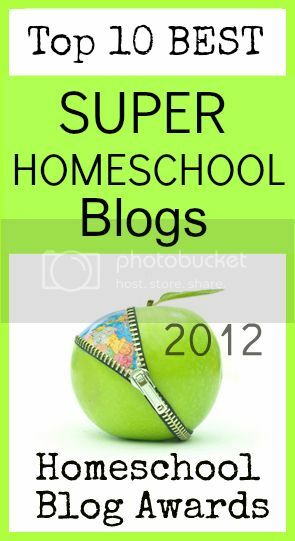 Come and see what the other crew members have to say about not only this product, but others from Read Naturally on the Crew Blog – http://homeschoolcrew.com/784200/ . I was given the products mentioned above for free in exchange for using them in my home, with our own learning style, and sharing how it worked for us. We are not required to give a 5 Pink Plastic Pig Review score – or even a 2 Pig Score– I am allowed to put the pigs entirely away and kindly ask you to look at the other crew member’s reviews with different ages and styles of learning and mention that it didn’t work well for us. So – for the record – 5 Pink Pig Pile Pigs (Out of a five pig scale). 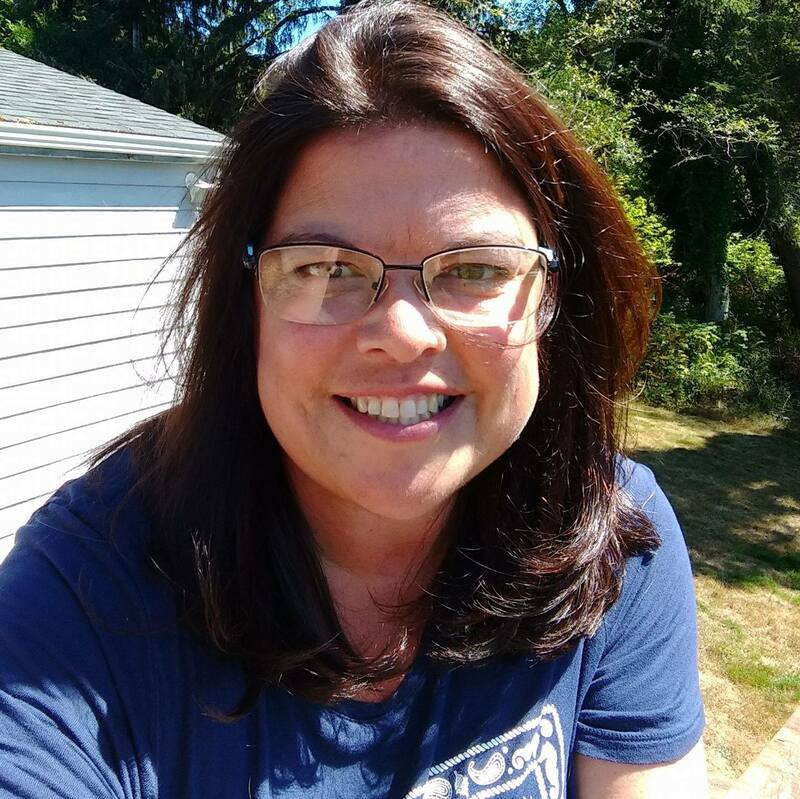 This entry was posted in Some Schooling and tagged Boys, Fluency, HomeSchool, Lincoln City, One Minute Reader, Oregon, read naturally, reading comprehension, speed. Bookmark the permalink. Reblogged this on English Reading Comprehension.